We are living in an age of live streaming. Almost every field of our daily activities goes online for live streaming. The industry of video games is not different from this trend. A bunch of game streaming sites is working to keep pace with the trend. And the gamers like you are in a great rush to make professional channels on those sites. But many of the gamers find it difficult to get the best twitch overlay. You might be one of those gamers. Don’t worry if you are one of them. We have made your journey easy by compiling the best overlays available on the market. BattleGround is one of the best premium twitch overlays available on the market. Twitch Temple is the seller of this mesmerizing overlay. For its splendid design, the overlay is becoming more and more popular among twitch streamers. Basically, the overlay has multiple modular elements and preset layouts. By using these features, you can easily customize the overlay according to your needs. Another interesting thing about the overlay is that it is fully animated. As a consequence, you can customize the colors with Xsplit Broadcaster and OBS Studio. The overlay, however, has been designed targeting PUBG gamers. So, you can buy this overlay if you are going to create your channel for streaming PUBG. There is nothing to worry about if you are going to stream another game. BattleGround has a set of layouts for other games. However, to buy this outstanding twitch overlay, you need to spend about $12. DropZone is a premium twitch overlay offered by Nerdordie, which is a blooming marketplace in the twitch industry. This overlay works well for battle gamers. But you can use it for any kind of games since its features are universal. The overlay comes up with a bunch of features. It is a full package indeed. The features of the overlay, however, include Webcam Frame, Starting, BRB, Intermission, Ending, Blank Versions, and Just Chatting. You will also get a bunch of profile panels and icons with the overlay. You can use this overlay at any streaming sites as it is a flexible overlay. That is to say, the overlay will work well with Twitch, Mixer, Streamlabs, and Youtube. So, you have nothing to worry about the flexibility of the twitch overlay. For your kind information, the price of the twitch overlay is from $9 to $18. VX Pro Green is a stream package, which is splendid in design. TwitchOverlay is the provider of this beautiful overlay. Though the company has a great number of overlays on their website, VX Pro stands out with great vigor. The overlay is animated as well. So, if you want an animated overlay, then you this overlay can be the best fit for you. The overlay comes up with some significant features. The salient features include Avatar & Profile Banner, Animated Overlay, Animated Screens, and Profile Graphics. In addition, it has a dynamic background with minimal coloring. And the background is so eye-catching that it can make anyone fall in love with the overlay. Considering all the features of this twitch stream overlay, it can be said that the overlay deserves to be the best on the market. So, you can buy it for your stream channel without any hesitation. By the way, the price of the overlay is $26. ElectroLyte is an exceptionally designed twitch overlay. The experts of Twitch Temple have designed the overlay for gamers. It has been designed especially for Fortnite game. But you can use it for any other casual games if you are not interested in Fortnite. The pack of Electrolyte has animated elements, multiple color themes, customizable scene layouts, etc. All the features of the overlay are highly professional, especially the twitch panels. The twitch panels that comes with Electrolyte are professional enough to draw the attention of gamers. Though the overlay is highly professional from different perspectives, the price of it is not so high. In fact, the price is noticeably reasonable for gamers all over the world. To be specific about the price, the overlay will cost you $20. Craftwork is one of the best overlays which TwitchOverlay offers to its customers. It should be mentioned that the premium twitch overlays of the company are professional enough to catch the attention of any gamer in the world. And Craftwork is a vivid example of their high-quality work in the industry of twitch overlays. The company has developed the overlay targetting World of Warcraft gamers. So, if you are a WoW gamer, then this overlay can be a great fit for your channel. In fact, it can be considered as one of the best overlays for World of Warcraft game. 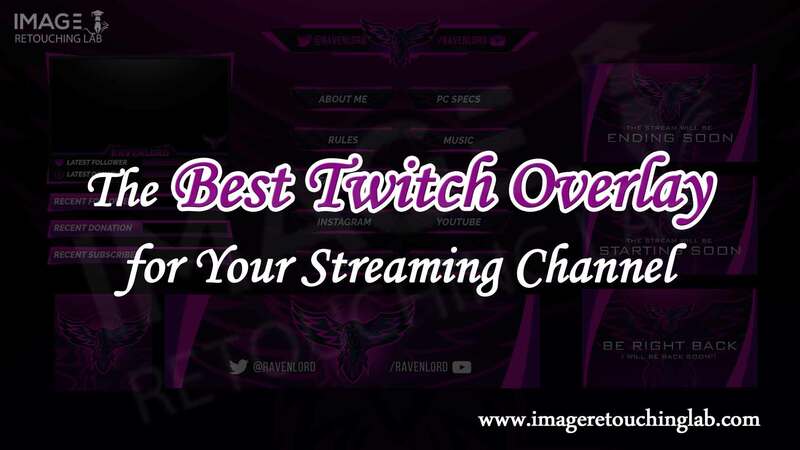 By the way, the overlay comes up with a bunch of essential features such as Header, Info Panels, Stream Alerts, Social Panels, Webcam Frames, and an outstanding background. With all these features, you will get Craftwork only for $10. That is to say, the overlay is highly reasonable for beginners. Streamlabs, which is a desktop streaming application, offers this free twitch overlays for gamers. The company mainly works on tools and software related to live streaming. As a result, the experts of the company know about the demands of game streamers. Triassic is such a great work which proves the quality of the service of the company. Generally, the overlay has a good number of features. The main features, however, include Stream Sharing, Live, Offline, Be Right Back, and so on. You can also change the color of the theme as it is flexible to be changed. So, if you have a color of choice, you can use it in this free twitch overlay. Moreover, you have options to choose either static or animated themes for the overlay. Raptor is another great twitch overlay to choose from thousands. WDFLAT, an online streaming platform, offers this excellent twitch overlay for free. Though the company offers more than one hundred free twitch overlays, Raptor draws our attention first. The overlay is generally meant for Fortnite game. In fact, most of the twitch overlays designed by the company are Fortnite-inspired. So, if you are Fortnite fan, Raptor can be your starting point in the world of live streaming. In general, Raptor comes up with some excellent elements such as Twitch Panels, Logo Esports, Twitch Offline, Youtube Thumbnail, Youtube Banner, and so on. Once you download the pack, you will get all these things without any cost. It is one of the generic twitch overlays of Strexm. And the overlays of the company are undoubtedly good. One can manipulate the overlays offered by strexm according to one’s needs without facing any issue. It is because the overlays are fully dynamic. In addition, one can change the content of the stream through the intuitive online editor of Strexm. Dark Matter, however, is very simple at the very first sight. It does not look professional when you first see it. It is because the design of the overlay has nothing eye-catching. Generally, the overlay has a top bar showing the latest followers, social media icons, and recent donations. Twitch Temple is the designer of this awesome twitch overlay. The company offers Bootstrapped to its valuable clients for free of cost. Though it is a free twitch overlay, you will not be dissatisfied to use it for your game streaming channel. That is to say, the overlay is one of the most perfect overlays for beginners. Bootstrapped comes up with a bunch of essential features for game streamers. In general, you will get a webcam, starting panel, gaming panel, offline screens, and a set of icons with this beautiful overlay. This overlay, however, does not provide the logo in place. But it is not a big problem for streamers as there are options for them. And it is a matter of joy that you, as a game streamer, can design your own modular to lay out the overlay according to your taste and needs. Rogue is a startling free twitch overlay offered by TwitchOverlay. It is a blue colored overlay, which is very clean and crisp in design. In fact, anyone in the world will fall in love with the overlay at the very first sight. TwitchOverlay has developed this excellent overlay especially for Battlefront 2. As a result, streaming Battlefront 2 is highly handy when you use this overlay. For this reason, any Battlefront 2 gamer is bound to like the overlay for his game streaming channel. The overlay has a series of info panels which are necessary for any streaming channel. Besides, you will get some pretty good alerts, webcams, and some boxes for the top corners. You will also get a PSD file in order to edit the header of the overlay with your social info details. Now, you have come to know some of the best overlays available on the market. Check all these overlays on your own to find out the best twitch overlay for your game streaming channel. While checking these overlays, you should consider your channel. To clarify, you should pick up the one that will best fit your game. However, if you think that you need a custom twitch overlay for your channel, then it will be a prudent decision to choose Image Retouching Lab. The company has some highly qualified experts who are experienced in making professional twitch overlays.